Mikkeller Continues To Take Over The World. Searching for the brand new Mikkeller Bar in Bangkok isn’t necessarily what I’d call easy. At least it wasn’t when I was trying to find it on the second night after it was opened officially. I found their address and plugged it into Google Maps, and up came some far off soi off a soi on Ekkamai off Sukhimvit that I thought for sure was going to have me end up in some strange Thai neighborhood in Bangkok wondering where I was. Mikkel Borg Bjergsø, owner of the gypsy brewery Mikkeller, has chosen to stick his third bar on the planet (the other two are in Copenhagen, Denmark – his home country, and San Francisco) not in the heart of New Bangkok, but hidden, right nearby. The bar itself is simply a house in the more upscale Ekkamai neighborhood converted into a living space upstairs, and the bar downstairs, with the refrigeration and keg storage space in the back. They’ve turned the lawn into an exceptionally lounged out grassy area with squatter tables with upscale beanbags for chairs. There’s a patio as well with about eight or so taller sit tables for those that don’t feel like being on the ground, but not in the AC controlled non-mossie environment inside. To locate the bar, you can now search it on Google Maps, but I may as well just tell you how to get there anyways: Head to Sukhimvidt Road and head towards Sukhimvidt 63 which is the Ekkamai neighborhood soi. Take a motorbike taxi from there down to Ekkamai 10, which will be on the right hand side of the street coming from Sukhimvidt. From there it’s a short walk. Simply walk down Ekkamai 10 and take your first right. Then take your first left. In about 20-40 seconds on the right you’ll see a house, yes I said a house, that just happens to be where you’re going to find absolute deliciousness in the beer realm unlike anything else in Thailand, or potentially all of SE Asia for that matter. When asked on why Mikkel had picked the location, Pete, the Tap Master (says his card), resident of the establishment, and more outspoken of the three main gents that run the place, simply said, “He wanted it to be a destination. We don’t want every drunk idiot traveling in Thailand to be able to just stumble in.” Mikkel’s beers range from a 1.3% ABV Low Alcohol Wheat Ale called ‘Drink’in The Sun’ all the way up to a 14% ABV American Strong Ale brewed with To Øl called ‘Walk On Water’. Like any new product or service anywhere, these types of things can take some getting used to, especially when the country you’ve landed in normally serves beer at a flat 4-5% ABV. That evening I chose carefully (as always) and ordered a 12% Imperial Stout named ‘George!’, a juniper berry infused IPA named ‘Baltic Frontier’, a brilliant sour from Mikkel in the ‘Spontaneous Series’ titled ’Spontandoubleblueberry’ (which ended up being one of the best beers I’ve had in almost a year), and a really well done DIPA (Double-IPA for those not in the know) called ‘Dangerously Close To Stupid’. All were fantastic, with the blueberry sour being one of those brews that your intense beer hunter/geek/snob yearns for in his or her global search for the best brews on the planet. On tap at Mikkeller Bangkok. This was an absolute delight! Pale yellow pour, medium white head. Notes of grassy fields and a light spice hop. Flavor is light but full of grass, spice hop, and a beautiful bitter finish. Wish I could get 6er’s of this in the States! A must try if you hit the BKK location. Tap at Mikkeller BKK in January. Sampled a few that night, but went for the two house brews first. The Pilsner being rather outstanding, and the Brown not really adding up so well beside it. Earthy flavors amongst a touch of sweet coffee malt, and a minor roast end. Thin body. Decent, but not great. Tap at Mikkeller BKK…sometime beginning of February. FULL ON. If you can find this one, get it. I don’t know how often I rate Appearance as a 5, but this beer is blue. Full on brett blueberry funk on the nose. Blends somehow brilliantly and perfectly. You know it’s gonna be a puckerfest. A touch of sweet fruity malt up front before a blast of wood, barnyard, and in comes the blueberries – abound! All over. But sour blueberries, just heaven. Brett and wood in the finish, everything lingering forever – this is one tasty beverage! Tap at Mikkeller BKK beginning of February. This was another one of my favorites in the series Spontan. Whatever it was in the gooseberry it really kick in well with the brett and funky barnyard flavors for a beautiful sour elixir I wanted to drink forever. Dank! 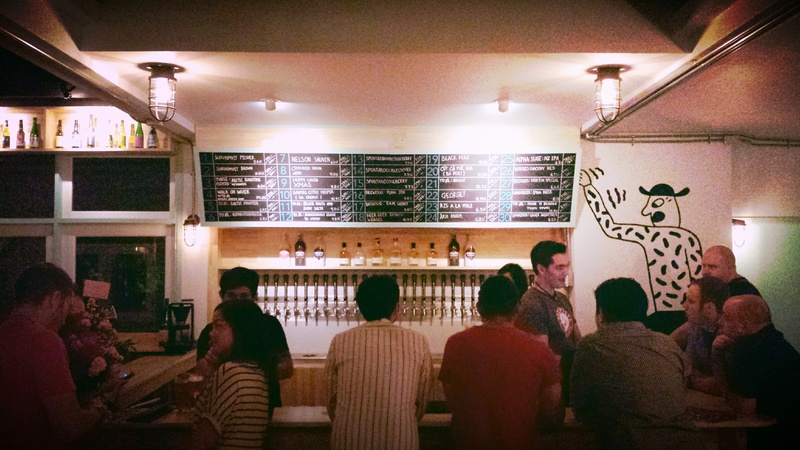 Even if you have only a day or two in Bangkok, if you’re a beer geek whatsoever – stop through Mikkeller BKK. You won’t regret going on a bit of a Goose chase! AROMA 7/10 APPEARANCE 3/5 TASTE 7/10 PALATE 3/5 OVERALL 16/20 Well, you got to give it to them. DFH continues to pump out some really odd and wild ideas with their brews. Some really hit it, some do not. After hearing this one was going to be more on the actual “limited” status (aka 66 cases of 6 to the state of Washington, with many stores selling one-per-custy), I hopped on it as soon as I caught wind when it was going to be released, as I just happened to be in a larger city (Seattle) when it dropped. Found one at Whole Foods downtown, they got 12 bottles total. What made this interesting was that the beer guy at WF didn’t know what was coming with Positive Contact. I informed him that inside each case, in his case twice, was a brand new 10″ from Deltron 3030’s Dan The Automater. Gangster. Anyways, I attempted to score one of the two records, failing unfortunately. Grabbed one of the twelve for $12.99+tax (thankfully not any more than that) and went on my merry way to an epic weekend of glamping upon glamping in The Meadow. Upon opening the bottle in the Meadow, a light apple esther comes wafting out the bottle, speckled with hints of yeast. A deep pale gold pours into the glasses. Hints of the spices start to hit the nostrils a bit more once the brew sits in the glass, but these notes are not overpowering. 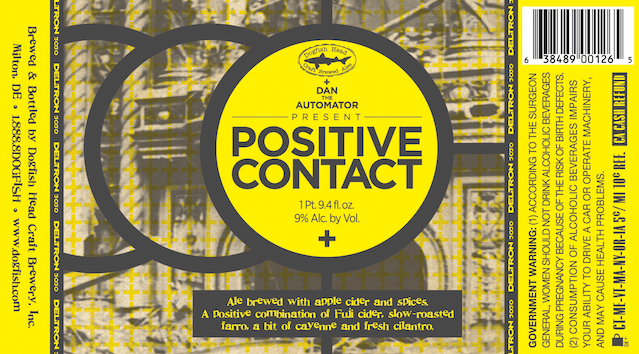 Once the brew hits the tongue an overall sense of many flavor notes step in slowly one after the other: citrus, green and yellow apples, muffled peppery spice, and straw…which transmute into what mainly seems to be a light cider. Definitely don’t believe I’d tasted anything quite like it before. That said, the flavors, while noticeable, were unfortunately faint in their delivery. The cider note takes you through the finish with a polite hint of the 9% ABV, but does not linger for all that long. I was happy that the token malt characteristics of many DFH brews over the past 5 years were not present for the most part! A novel idea mostly pulled of once again, but it could use just a tiny kick in general for my tastes. Nice work to whomever got a plate with their brew! 11.2oz from Belmont Station in Portland. Pours a deep dark brown, barely able to see through at all. Aroma is roasty toasty with gentle hints of banana, rose, and the hibiscus. Flavor is sweet up front with the rose (and the berries? ), and gets spicier with the hibiscus as the flavor settles on the palate. Remains fairly roasted throughout. Has a nice kick to it. Lingers. Quite a thick brew, lips smacking for sure.